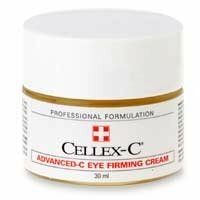 Cellex C Advanced C Eye Firming Cream - Again, I swear that the eye area is the first thing to go south. Well, no unless you've nursed 4 children. ha :) So, I'd say by the age of 25, it is a good idea to start using products that really benefit the eye area. It's never too early to begin thinking about anti aging products. I really wish someone would have given me this same advice early on. The Cellex C Advanced C Eye Firming Cream gives your eye area a large dose of yummy Vitamin C. Vitamin C doesn't just ward off nasty colds; it also helps smooth crows feet, and tones sagging skin. This advanced eye cream also contains aloe which gives your eye area a burst of hydration. Sometimes fine lines are just a product of parched dry skin. I really found this out the hard way. Another fabulous ingredient that is found in this firming cream is Grape Seed Extract. This extract promotes cell health and skin elsticity. Also, the procyanidins present in the Grape Seed protects the eye area from sun damage. So, is this a good eye cream?? .....YES! Use Eye Firming Cream in the morning. apply a thin layer to the orbital bone. This is located on the skin that surrounds the eye. It is important to avoid your eyelids and eyebrows. "My dark circles are gone!" "After 6 weeks, I notice a huge difference in the fine lines around my eyes." "My husband is even noticing a difference." "A little costly, but a little goes a long way and it is well worth the money."